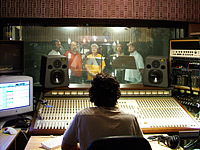 Our recording studios were founded in 1963 by Dasi and Avi Yaffe. For over 40 years, our studios have been offering a wide array of professional services, including music recording, narration, postproduction, outdoor recording, editing services, technical services for professional journalists, and radio broadcasts for stations from all over the world. Our flexibility and versatility enable us to accommodate any audio solution required. Our studios are located in Jerusalem (near the entrance to the city) and include recording, editing, broadcast and control facilities. In addition, we operate on location a professional retail store offering hi-end stereo systems, home cinema equipment and headphones. Professional microphones by Neumann, AKG, Sennheiser and more. Transfer of independent soundtracks to CD, DVD, DAT audio tapes, magnetic tapes, and other formats. Copies made from magnetic tapes (1/4" reel-to-reel) and records (of all speeds), improving the old sound as much as possible and transferring it to a modern format. Validation of tape originality and continuity, presentation of an expert opinion, and appearance as an expert witness in court. IsraCast is an independent, multimedia broadcast and distribution network that focuses on Israeli foreign affairs and defense issues. This non-profit website provides up-to-date and in-depth analysis and comment on the major news events of the day. The website has been operating on a full time basis providing integrated written and audio reports, exclusive interviews, flash presentations and photos. The high quality audio material is available to radio stations and websites, as is all the other material. Specializing in small events (lectures, conferences, plays and shows), we offer professional digital or analog recording that can be edited in the studio. Microphones, Headphones, Portable Mini-Disc, DAT, Cassette Recorders and more. In small (individual media) or commercial (over 500) amounts. Speakers for home and garden, subwoofers, amps and preamps for stereo systems, LCD and plasma screens, CD and DVD players, radio receivers, headphones and headphone amps, record players, home cinema equipment, home cinema projectors, universal remote controls, cables and accessories.